Final Fantasy XIV: A Realm Reborn got off to a rocky start, but it could have been much worse. Back in 2010 after the release of Final Fantasy XIV version 1.0, the worst happened. It was a perfect example of an MMORPG done wrong. It was massive, but empty; an incomplete game. The user interface was a confusing mess. And despite lovely music and beautiful visuals, the reviews painted a much uglier picture, as a quick look at the scores on Metacritic reveal. Only 3 of 26 critic reviews were considered positive and over 350 user scores averaged a mere 3.8 out of 10. It didn’t matter so much whether or not the servers were stable when the game itself was such a disappointment. With that in mind, I’m happy to say that the launch of Final Fantasy XIV: A Realm Reborn was a disaster, because it was a disaster for the right reasons. Square Enix and all of the people responsible for Final Fantasy XIV: A Realm Reborn must be pretty happy right now. Their biggest problem is that their game is too successful! Normally when an online game launches and all hell breaks loose, I am right on board with the masses, screaming and rabbling about how the developers should have been prepared. But in this case, I’m just relieved. They did it. It took them three damn years, but they did it. Final Fantasy XIV: A Realm Reborn is good. It’s very good. After Final Fantasy XIV version 1.0 launched in September of 2010, Square Enix apologized to customers for the quality of the game. One year later, their CEO, Yoichi Wada, said in a press conference that “the Final Fantasy brand has been greatly damaged.” Square Enix was determined to make things right, both out of respect to the fans and to fix the damage done to their most important brand. I can now say with confidence that they have achieved their goal. As a fan of the series, I’m relieved that Final Fantasy XIV: A Realm Reborn is the game version 1.0 should have been in 2010. Obligatory cat girl… er… Miqo’te. She’s a Miqo’te. Word of this good news spread quickly, and by the time the game launched, the servers were filled to capacity almost instantly. Unfortunately, the queuing system was pretty much broken, so instead of having to wait a few minutes, players were booted back to the title screen with error 1017 when they tried to select their characters. Whether or not they could get into the game during primetime was pretty much a matter of luck or stubbornness. The more persistent players attempted to get into the game for hours on end, looping through the title screen and character select screen before getting dumped back to the title screen over and over again. As a result of all this, error 1017 gained notoriety that was reminiscent of error 37 from Diablo III (that error message actually achieved meme status). There were other issues as well. Error 90000 booted some players from the game and in some cases it didn’t let them back in. Then there was error 2002 that prevented all players from even trying to log into the game, as if the entire login server was down. But to me, the biggest issue aside from not being able to login was that Square Enix was forced to restrict character creation on pretty much all of their servers. That made it impossible to get all my friends onto the same server. Fortunately, the worst of the storm seems to have blown by. The list of worlds that have restricted character creation is constantly being adjusted, but is getting shorter and shorter. New servers have been added as well, and in the last couple of days, it’s been a lot easier to play the game, even during primetime. There are still ongoing issues and plenty of things for Square Enix to work on, but compared to launch week, things are going pretty smoothly now. All that’s left is to play the game! 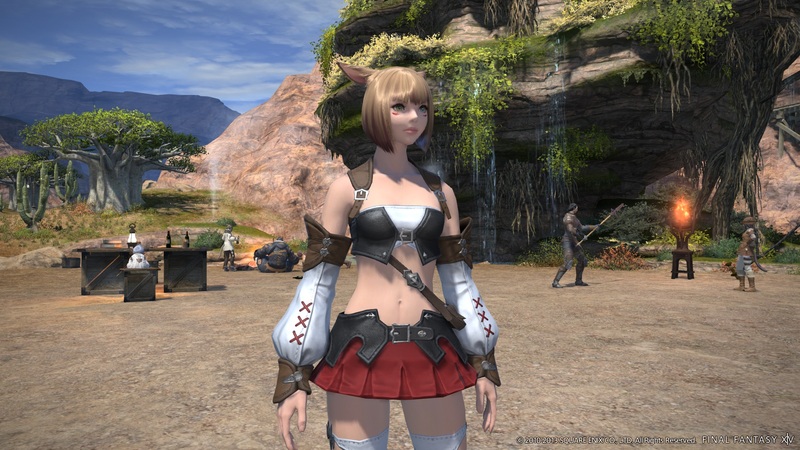 Final Fantasy XIV: A Realm Reborn is inspired by the best MMORPGs on the market. Influences from World of Warcraft and Guild Wars 2 are easy to spot. Combining the best of those games with the lore and charm of the Final Fantasy universe has resulted in a game that’s both accessible and engaging. Though the launch was a disaster, it was for the right reasons. A Realm Reborn has turned Final Fantasy XIV into a game worthy of being a numbered title in the series. Check back soon for our next Final Fantasy XIV: A Realm Reborn article which will cover the details about what makes the game great, and gameplay while getting a character’s level up to 25.